Students with traumatic experiences bring those experiences with them to school. These strategies can help foster a feeling of safety. Many children and adolescents walk into our schools and classrooms carrying toxic levels of stress. They’re on edge, and their neuro-anatomy is in a state of dysregulation, which drives their behaviors and makes it difficult for them to learn. I recently traveled to Mississippi and met a number of young students in a primary classroom who brought these points to life. T. is 8 years old, although his lexicon is that of a street-wise 19-year-old. He’s angry all the time. He’s volatile, aggressive, and defiant beyond words. He feels deeply and is very protective of his younger sister. A few years ago, T. watched his mother murder his father. Now his mother is incarcerated, and he lives with his grandmother. T. is on medication for attention-deficit disorder, high blood pressure, and depression. T. is not only carrying in his adverse childhood experiences (ACEs), he’s living in a community environment that is adverse—last week bullets came through his window, just missing everyone in the living room. Some mornings he walks into the classroom and just flops on the carpet and sleeps. Q. is 7 years old. He cannot sit still for more than 15 seconds. He’s constantly hungry, trying to find crumbs on the classroom floor to eat. He will drink water out of anyone’s bottle. He cries most of the time, and has an empty, faraway stare. His mind is not present in school. He lives in a world of hurt, pain, and trauma. Q. has learned at a very young age to dissociate from his overwhelming emotions as a way to protect himself from more pain. When his teacher, Ms. D., walks him to the bus, he waves at her until he can no longer see her, then presses his face against the window and waves a little more. More than 46 percent of U.S. youths—34 million children under age 18—have had at least one ACE, and more than 20 percent have had at least two. Children and adolescents who have experienced significant ACEs have fundamental needs that have to be met before cognition comes to life. Feeling safe, secure, and felt by another person are foundational for emotional, social, and cognitive brain development. Young people who have experienced trauma feel unsafe at their core. We must begin to create for these young people a place of safety, connection, and emotional regulation. The brain is built for resilience, and resilience research indicates that one caring adult in a child’s life can buffer, reset, and repair the brain’s sensitivity to stress and adversity. These strategies work well in community circles or for bell work. They can also be implemented at the end of the day or class period. 1. Clothespin drop: As students enter class, they clip a small note to a clothespin and drop it into either a “celebration” or “challenge” bucket. Before class begins, I always offer students a chance to share a challenge or celebration. It’s always a choice. 3. 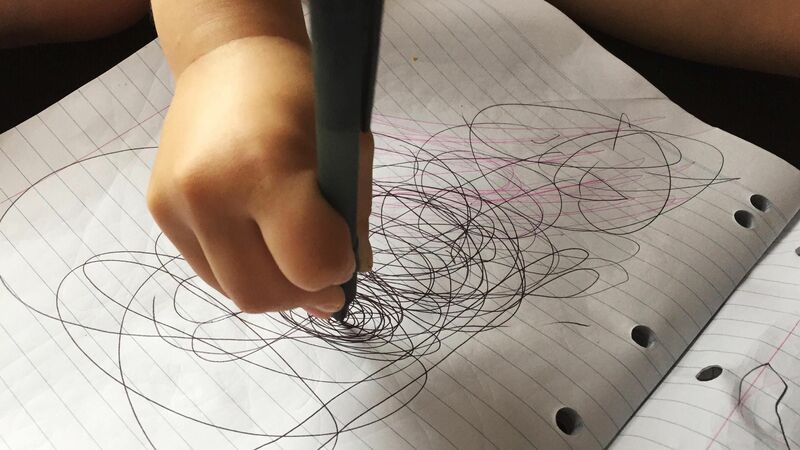 Bilateral scribbling: This promotes emotional regulation and exercises sensory and motor systems needed for cognition. With a large sheet of paper and two markers—one in each hand—students will follow your directives. Have them make random marks up and down, then horizontally. Next, have them make large arcs across the page, followed by large circles, first fast and then slowly. Finally, have them make dots all over the page. Is there anything about this scribbling that resembles you or any part of you? Is there anything about this scribbling that is nothing like you? Are there any pictures or designs you see in this scribbling? What word comes to mind as you look at your scribbling? Would that word describe something about you or someone you know? 4. Animal symbols: Have students view pictures or figures of animals and then choose an animal that they’re most connected to, either positively or negatively—a totem, in Linda Chapman’s terminology. After they choose, ask the following questions and have students write out, draw, or verbally share their responses. What is it about this animal that you like or dislike? How is this animal like you in any way? How is this animal nothing like you? What are the two best qualities about this animal? What are the two worst qualities? What would the home of this animal look like? Who is in this animal’s family, and do they get along with one another? If you could give this animal magic power, what would it be? This exercise promotes connection and emotional regulation in a safe environment. Stressed brains do not learn. These fun activities, done over time, will slowly create the environment necessary for young people with ACEs to feel safe and learn.